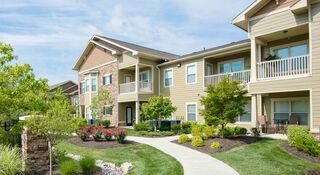 The Sovereign at Overland Park is near everything in Johnson County, KS. This affluent neighborhood in Overland Park, KS is located between US HWY 69 and I-35 and situated within the elite Blue Valley School District. The community’s prime location situates residents within easy reach of delicious meals, multiple shopping venues and enticing entertainment options. Just twenty miles outside the Kansas City limits, The Sovereign at Overland Park is far enough from the city to give you scenery and space without disconnecting you from the culture, flavors, or fun associated with city life. With easy access to US Hwy 69, I-35 and I-435, you can navigate between the city and the suburbs with efficiency. The Sovereign’s luxury community is also located in the highly rated Blue Valley School District and is just a few miles from Johnson County Community College. A bit further down KS-10 E, The University of Kansas is within commuting distance, too. The community’s prime location puts you within reach of fine dining and shopping venues as well as within proximity of indoor and outdoor entertainment options. There’s a dining destination for every palette in Overland Park, KS. Specializing in East African cuisine, Taste of Africa specializes in chapatti, goat stew, and fried fish. Elsewhere, Izumi’s Japanese Steak and Sushi is the perfect place to satisfy a craving for spicy tuna. If you are in the mood for America fare, try J. Alexander’s, a contemporary restaurant known for its wood-fired cuisine. A fantastic brunch option, Le Peep offers a casual breakfast and lunch menu. Plan the perfect day out in Overland Park, KS. You can leave your apartment for an early tee-time at St. Andrew’s Golf Club, catch a game at Scheels Overland Park Soccer Complex or stroll through one of the city’s many parks. Next, relax during a film at B&B Theaters. Alternately, if you want to pair your movie with a meal, opt for AMC Studio 28 as it has dine-in theater showings. Finally, round out your day with retail therapy. Oak Park Mall has two levels of retailers, including Dillard’s, Macy’s, Nordstrom and more. Make this neighborhood your home. Apply today or schedule a tour.